Combining ultra-high resolution and high-level automation, the InnoScan 1100 AL is perfect for fast, whole slide imaging. With three excitation wavelengths, it is ideal for reading cell microarrays as well as classic three-color microarrays. 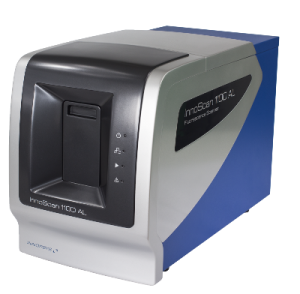 Characterized by its ease of use, performance and versatility, the InnoScan 1100 AL is the ideal tool for cell microarrays as well as three color microarrays. f up to 0.5µm/pixel or a 20x objective equivalent, the InnoScan 1100 AL is the highest resolution microarray scanner on the market. This combined with a real time autofocus system and confocal PMT detection, the InnoScan 1100 AL provides high-quality images for detailed analysis of your microarrays. >Easy automation: Provided with a user-friendly image acquisition software and 24-slide autoloader, the InnoScan 1100 AL is capable of fully automated scanning of 24 slides at a time. >Multiplexed whole slide imaging: The InnoScan 1100 AL is capable of scanning any microscope slide with various substrates: cells, tissue, proteins, DNA, glycans, peptides and others. 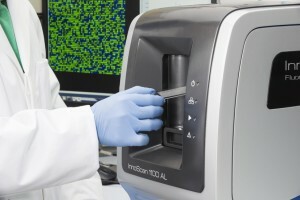 Equipped with three excitation channels, it empowers users with more multiplexing capabilities, thus allowing the analysis of several samples or markers on the same slide. The InnoScan 1100 AL is a confocal scanner equipped with 3 excitation lasers (488, 532 and 635nm) which are coupled with 3 extremely sensitive photomultiplier tubes (PMT) which allow whole-slide image acquisition. The PMTs are linear over the entire dynamic range (from 1% to 100%) making it easy for the user to set PMT gain for the perfect adjustment of the fluorescence signal levels to avoid saturation. The InnoScan 1100 AL has the highest resolution on the market (up to 0.5µm/pixel) and uses a real-time autofocus system which adapts to substrate distortion, thus making the entire reading area completely uniform. The InnoScan scanners are industry renowned for their excellent photometric properties, particularly in terms of sensitivity and signal-to-noise ratio. Thanks to Extended Dynamic Range mode (XDR), InnoScan scanners have a dynamic range of over 106 and are thus capable of detecting the weakest signals while avoiding saturated spots.